Back in June, we reported that music streaming service Rhapsody was planning to change its name to Napster as a part of a total rebranding. Napster had transformed from a file-sharing site to a streaming service a few years ago when it was bought by Best Buy, but the name was dropped when it merged with Rhapsody. The company reversed that decision in June, dropping the Rhapsody name in favor of the slightly more nostalgic Napster name. Apparently, though, the Napster nostalgia isn’t going to stop there. 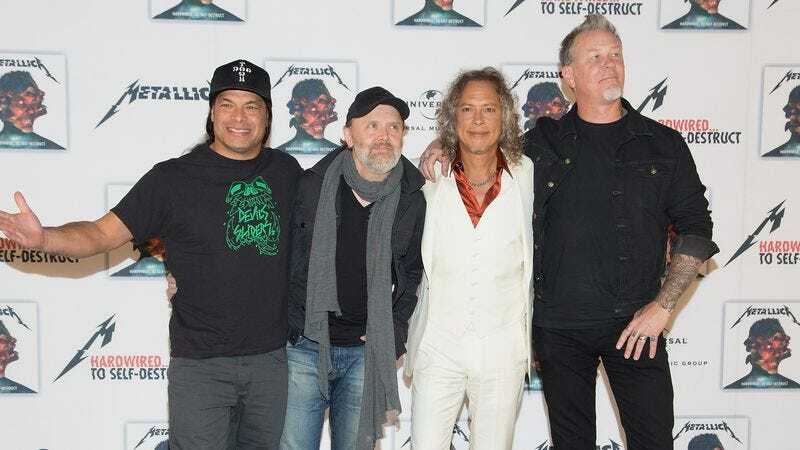 According to Billboard, Metallica’s entire catalog is now set to debut on the service, 17 years after the band famously sued the company for facilitating music piracy and infringing on its copyright. Granted, this is hardly the same Napster as the one Metallica sued all those years ago, and the Metallica boys themselves are getting a little gray these days. But this is still an important peace accord between the bands and streaming services of the world. It’s like an official confirmation that it’s tough to make money on all sides of the music industry in 2016, so everybody involved might as well get along. This announcement ties in with the release of Metallica’s Hardwired…To Self-Destruct, which will be available everywhere—including Napster—on Friday.